I don’t usually post photos to the blog on the weekends since I am usually out exploring, but since I happen to be home this morning for just a little bit I figured I’d post a photo I took last night on a quick evening trip to Moab. This is my second visit to the Moab Maiden at night, so I wanted to try something a little different from last time. The Big Dipper was hovering just above the horizon, so I framed a shot with the Moab Maiden just below it. 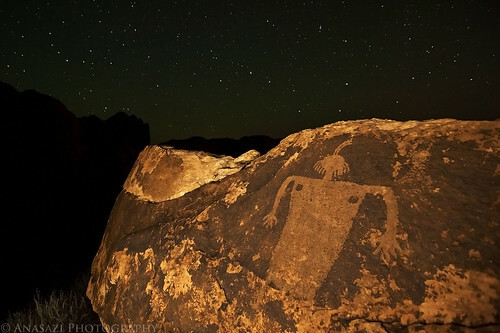 There’s just something that appeals to me with this petroglyph and night photography…..so I’m sure I’ll be returning again sometime in the future. Click on the photo to get to a larger view on Flickr.